Black scalloped note cards from Michael's or if you live near a Paper Source their round ones are even better. 2. Using hot glue gun attach pom pom trim to the back bottom edge of scalloped card. 4. 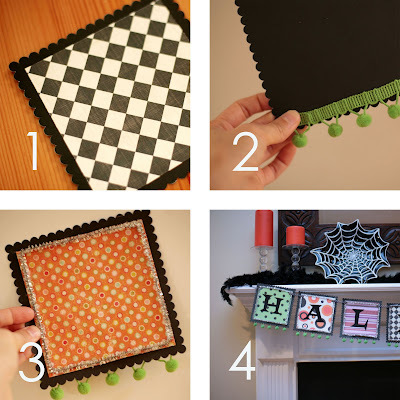 Apply letters to each one, punch a hole in top corners, string onto a ribbon of your choice and hang. Why not make one for every occasion/holiday? as seen on sara b's blog. And... While it's still the carmel apple season try making these easy Caramel apples! This lady is genius! "We made mini "caramel" apples last week and they were a fun and easy snack. 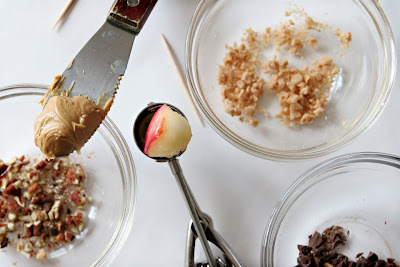 To keep things simple and quick we spread peanut butter on the apple instead of caramel, and dipped the apples in crushed nuts and toffee and chocolate bits. Using peanut butter and nuts made me feel this stayed more in the category of "snack" rather than "treat." Use an ice cream scoop to scoop mini-apples out of a regular apple. These don't turn out as round as you might think, but they still work. You could also use thick slices and call them moons. Stick a toothpick in the skin side of the mini-apple. Spread on "caramel" of choice. Use the real stuff, or for a quick fix try peanut butter, nutella, sweetened cream cheese, etc. The apple is not going to look pretty at this point; the toppings are what round it out and make it look nice. Hand apples to the kiddos and let them dip into the toppings of your choice. We used pecans, toffee and chocolate bits, but you could use just about anything: flaked coconut, sprinkles, mini m&m's, crushed granola, or maybe even sesame seeds or ground flax seeds. The dipping itself is so fun you could probably sneak all sorts of healthy stuff in there if you are so inclined. Enjoy, and then make another one. My kids really got into choosing different topping combos for each apple. It was cute."